Google can currently look at the user interface and not just see specific font sizes but see how a user would see the fonts on different mobile devices. Google is also able to see how a user will see how a page scrolls on a mobile interface; are the buttons large enough to click on; is the interface confusing to mobile users? And to force web masters to act, it is expected that user experience is to become part of Google’s ranking algorithm. Not a shocker, but it may prove a handful for sites that are poorly optimized for mobile. How to measure mobile user experience? Barry recomends to use the “Fetch as Google” tool from Webmaster tools. 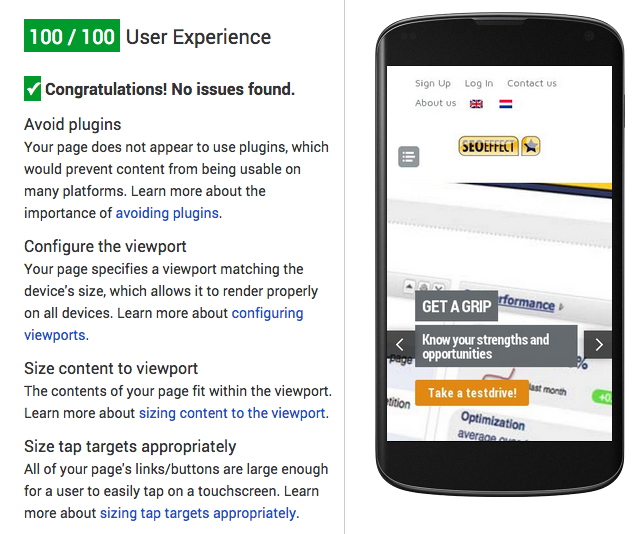 An even more convenient option we’d like to add is Google’s Page speed insights that also has a section on user experience for mobile. The SEO Effect site scores full marks in the page speed insight tool (but to be honest, we’re struggling a bit with getting page speed itself into the green numbers. Tips are welcome 😉 ).